The greatest hitter and pitcher of their generation were once again shut out of Cooperstown, thanks to the petty, sanctimonious, grudge-holding members of the Baseball Writers’ Association of America. 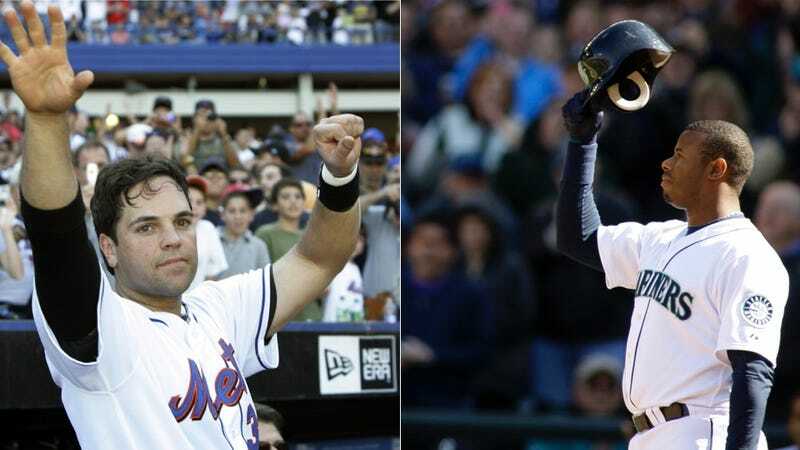 Mike Piazza and Ken Griffey Jr. did make it in, though, and they were pretty great ballplayers. Griffey got in with 99.32 percent of ballots—or all but three of them. We eagerly await those voters’ explanations. It’s the highest vote total of all time, topping Tom Seaver’s 98.84 percent. Piazza is in with a healthy 83.0 percent of the vote. Jeff Bagwell just missed at nearly 72 percent, 15 votes shy of induction. Tim Raines was at 71.6 percent. Both should make it in easily next year. Trevor Hoffman, in his first year on the ballot, received an impressive 67.3 percent of the vote. There were big jumps from last year for Curt Schilling, Edgar Martinez, and Mike Mussina. Bonds and Clemens receive slightly smaller bumps from last year’s vote, but there’s still a ways to go. Those who did not receive at least five percent of the vote—including Jim Edmonds—will be off the ballot next year. There were 440 ballots cast this year, down from 549 last year, a sign of the ongoing purge of members who don’t cover the sport and haven’t in a long time.